Payroll Mate® makes processing Auto Dealership payroll easy and affordable. Our payroll system offers many features that can cater to the special payroll processing needs of car dealers and automobile retailers. With Payroll Mate® you can custom create income categories such as commissions to ensure you can pay your employees based on their car sales. Payroll Mate® gives both new and used car dealers the tools they need to process payroll in-house while saving time and money. If you run an auto dealer, you have a lot of work on your hands. Not only will you have to sell your inventory and deal with a lot of clients, but you will have to pay all your employees correctly and on time, all while keeping your finances in order. This can be a costly proposition, and is often frustrating. If you are in the search for a payroll program to help your cause, the best solution out there is Payroll Mate®. • Payroll Mate® accurately calculates State and Federal withholdings, Social Security, Medicare, and net pay. • The standard program supports up to 10 companies with 75 employees each company. • Supports a variety of different pay types and pay frequencies. Pay types include hourly, salary, commission, bonuses, and many more. • Payroll Mate® supports Federal tax forms W-2, W-3, 940, 941, 943, and 944. • You are able to easily customize your payroll by having the ability to custom create unlimited user-defined income, tax, and deduction categories. • With Payroll Mate®, you can easily review multiple reports such as the Employee List, Taxes & Deductions, Payroll Totals, any many more. Then, you can even send these reports by email. 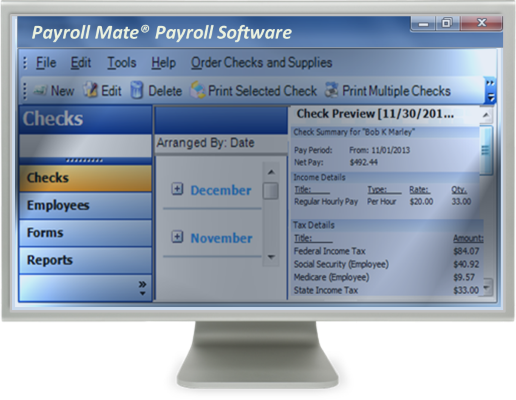 • Payroll Mate® works with Windows Operating systems right out of the box including 32 bit and 64 bit versions. It also works with Mac by using virtualization technologies such as Oracle Virtual Box and Parallels Desktop. • Payroll Mate® gives you the ability to export your payroll data to a variety of programs including Peachtree Sage 50, Intuit QuickBooks, and Quicken. • To ensure your employee’s data stays secure, you can easily set up a password feature, which allows you to protect yourself and your employees as only authorized users can log in and access any data. • Additionally, you can opt to mask social security numbers that are printed on employee’s pay stubs. • With Payroll Mate®, you won’t have to worry about data loss as you can easily backup and restore your employee’s payroll data. • Payroll Mate® provides built-in tutorials which offer step by step instructions on many features of the program. • If you are lost for any reason, you can get help quickly with Payroll Mate®. • You can offer direct deposit to your employees or you can print signature-ready payroll checks. Direct deposit is an additional cost add-on feature. Either way, your workers will be happy as Payroll Mate® can help you ensure that they are paid on-time and correctly, every week. • If your company offers sick time, vacation time, or other benefits, you will have an easy time tracking them with Payroll Mate®. • Furthermore, if you have 1099 recipients, Payroll Mate® can help. Simply purchase the 1099 and vendor feature for an additional cost and handling vendors or contractors will be a breeze. If you want the best solution to keep track of your payroll and auto dealer’s finances, you need the right program on your side, and the best one to check out is Payroll Mate®.